Ecumenical Patriarch Bartholomew of Constantinople but by other patriarchs, including Russia's Kirill. "The ideal scenario for me would be if along with Patriarch Bartholomew of Constantinople, the tomos on the autocephaly is confirmed by all the Orthodox churches, including the Russian patriarch. In my opinion, this is the only way [for Russia] to at least partially wash off the atrocities and the sins that were committed on the Ukrainian territory by Russian military, Russian propagandists, and sometimes, sadly, by Russian priests. Do I believe that this is possible? The Lord does miracles. I do not rule this out," Poroshenko said at the "Freedom of Speech" talk show on ICTV TV on Monday evening. He also stressed that no-one can veto the decision of the ecumenical patriarch. "But can Kilrill prevent them from giving us the tomos about autocephaly, the right to independence? I want to stress that no-one, including Kirill, has the right to veto the decision of the ecumenical patriarch. He does not ask permission from Kirill but holds consultations on this matter," Poroshenko said. 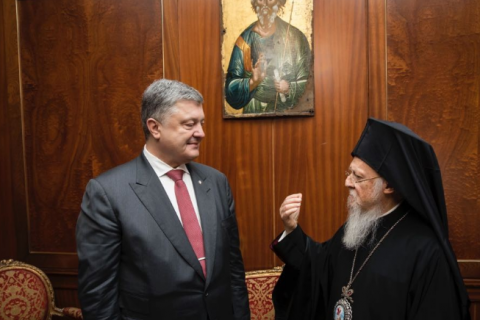 As reported, the Holy Synod of the Ecumenical Patriarchate in Constantinople accepted the appeal from the president of Ukraine to Ecumenical Patriarch Bartholomew asking the patriarch to grant a tomos (an official church document) about the autocephaly of the Orthodox Church in Ukraine, a decision was made to start the procedures necessary to grant autocephaly to the Ukrainian Orthodox Church. The patriarch also received an appeal from Ukrainian church hierarchs and the Ukrainian parliament's resolution in support of the president's appeal.